As we dumped our bags unceremoniously on the living room floor, grateful to be home after six hours on the 5, I noticed it still sat on the side table: the back issue of National Geographic dedicated to the giants. Though I’d read it, I hadn’t been able to toss it yet, for how often does a magazine feature your favorite trees on its cover? 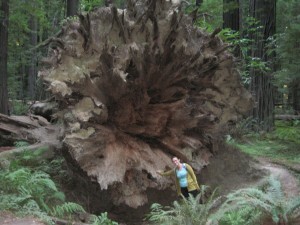 Not just any trees, but the largest trees in the world – trees that predate Christ, trees found only on your coastline? When we arrived at the grove of giants a few days back, I felt the same hushed splendor I always feel when in their presence. Too much artificial noise when you’re standing in the shadows of living things so much older and larger than you seems sacrilegious, like shouting in a cathedral full of praying nuns, then spitting in the face of the archbishop. It’s dark in the forest, beneath trees that tower above like sentinels, if sentinels could top 300 feet. Every inch of landscape appears in some variation of green or brown; bright branches, pitchy soil; leafy ferns, soft bark. Any moment now I expect Galadriel to materialize on the path with a train of elves following her. At this image my interior narrative points out what a nerd I am, and then I tell my interior narrative to shut the hell up, I’m not the only person who would conjure up Tolkien in such a place. Mike and the friends we’ve traveled with are jumping on a felled tree that sways up and down like a catapult, while I attempt to coax them on a short loop trail. “If you guys want to see the big trees, we need to take the trail across the road,” I say casually. They continue taking turns bouncing on the tree. No one seems to hear me. “We should go, before it starts getting dark,” I add. No desperation here, nosir. Finally, like a kid who can no longer wait in line for the bathroom, I tramp over by myself and read the plaques posted at the trailhead. 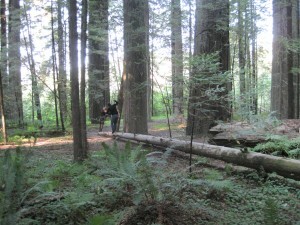 On one, I learn that all but 2% of the world’s ancient redwoods have been deforested. This pisses me off, and I mentally file away the information for later. Walking back to the group (this time they’re balancing on the felled tree with a large branch, à la trapeze artists), I try again to urge them onward. I repeat this whole exercise twice before convincing anyone to follow me. By this time I am nearly hopping down the path. Pointing out felled root systems that extend twenty feet overhead, I make Mike take my picture next to the monstrous beast. Then I proceeded to take no less than fifty billion pictures of trees in their various states. I decided to keep the magazine. 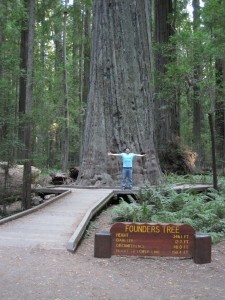 I would really love to take my kids to see the giant redwoods, they would be blown away! I certainly was – and I never outgrew it, either, apparently. They are magnificent, thanks for sharing. Palm trees are my all-time favorites. Something about the sound they make rustling in the breeze takes me back to my childhood in Arabia. Trees are awesome! Beduwen recently posted…Club Med – Vive Vacances! This makes me want to go back to NoCa! Gorgeous! 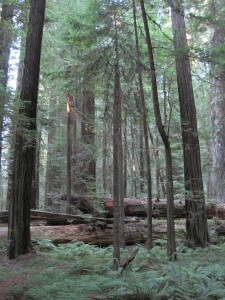 I love Redwood trees; I love your writing. They are so majestic, aren’t they? I love the church metaphor. Your photos and captions are wonderful, too. Cindy – The Reedster Speaks recently posted…Conversations about Lifelong Remorse and Urine. Oh man, this took me right back to Muir Woods. It’s been many years since I visited, but I distinctly remember the huge tree with the gap at the base that could fit a small SUV inside. Grand does not even suffice to describe these monsters. It’s pretty cool how passionate you are about them. If more people were, maybe they wouldn’t be almost extinct. There are few things that get my hackles up more…how could you destroy something so majestic? Sigh, I don’t get it. I would have followed you the first time! I love trees, especially the big, beautiful giants. I haven’t been to California, but Vancouver’s Stanley Park has some beautiful trees – and Cathedral Grove on Vancouver Island is exactly like you described: a religious experience. These are so gorgeous. I am so glad I got to see them through your eyes. Great post! These trees are amazing. I love that picture of you next to the roots. Really puts things in perspective. This was lovely and I like the way you tell everyone the facts. I totally do that with things I get excited about. I very much related to you in this, and love your photo captions. I grew up in the SF bay area and your writing totally brought me back there. I miss those trees. I get horribly homesick every time I see a picture. I’ve been wanting to move up there forever, partly because of how close I’d be to the trees…they’re hard to let go of, aren’t they? It really is an extraordinary spot! Oh no. 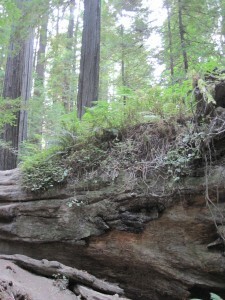 How can you NOT think about LOTR in the redwoods? 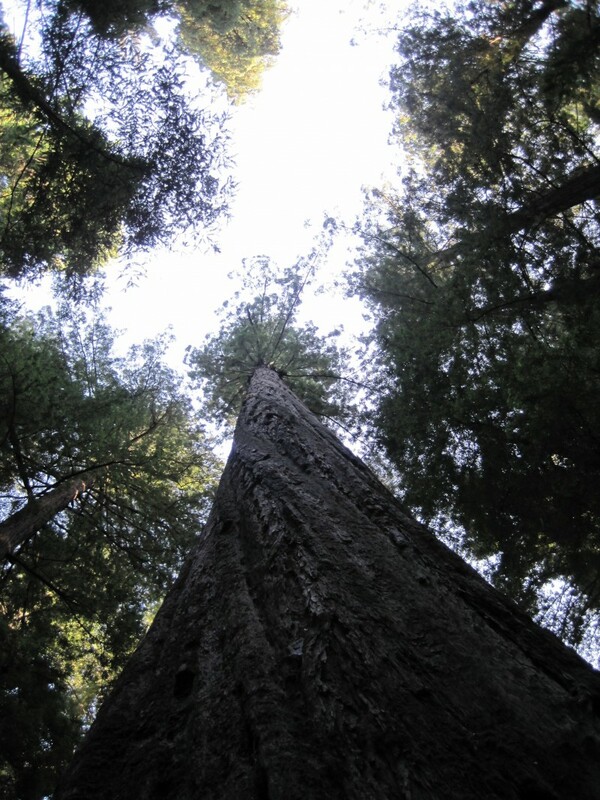 I love the Redwoods. I wanted to stop there on the way back from Disneyland, but I was escorting my father (whose back doesn’t like car rides). Been there four times and it’s always refreshing. It’s almost a spiritual experience just standing there. I don’t feel that way in the mountains, in the ocean, or anywhere else.